Over the past couple of years I’ve been deliberately avoiding using any form of third-party add in for SQL Server Management Studio. I was doing this since I was pursuing the SQL Server Master Certification, and wouldn’t have had access to these tools during the exams. Since I’m no longer actively doing this, I’ve started looking around. For several years, I’ve been using the DevExpress Coderush product for development work in C# and Visual Studio, having made the decision between it and ReSharper. That was a difficult choice to make. Fortunately, the decision for SQL Server is easier; I’m only aware of one, which is Redgate’s SQL Prompt. I had a look at this a year or so back, but decided to uninstall it due to the reasons given above. Having started looking at it again, and particularly with the new version I’m loving the experience. Tab History – When you close Management studio (SSMS), SQL Prompt saves the contents of all your open tabs, and reopens them when you open SSMS again. I do this at least once a day, and it’s stopped me kicking myself. You can also see the history of tabs that have been open, and this also has a preview screen (shown below) which is really helpful for all those SQLQuery1.sql files. 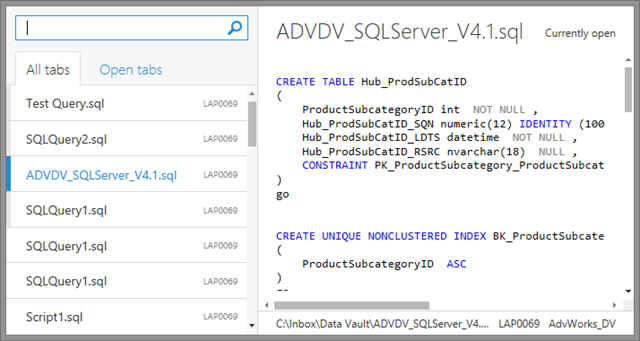 Improved Intellisense – It gives a more intelligent set of results to help you type your queries. This even goes down to the level of suggesting join criteria. Performance – One of the best features is that it really doesn’t seem to impact performance of Management studio. This was a hard one. The only thing that really stopped me using it (aside from the exam thing) is the cost. Would I recommend it ? Yes, definitely, it’s improved my SQL, reduced code errors and allows me to concentrate on what the T-SQL is supposed to do, rather than focussing on what the syntax is. There are a couple of features I’d like it to have: I’d quite like it to also work with MDX. I’d like it to also recommend code changes, to help with implementing best practices. I was offered a free licence of SQL Prompt, by Redgate, for this review. However, the content of the review has been written by myself, and the benefit of the licence is that it gave me time to write the review.